I've only seen this one once. But for me it was a special moment. I saw this on the porch of the bunk when I was at camp at night. It was beautiful. I hope I see another one this year. And this year I'll have my camera ready! 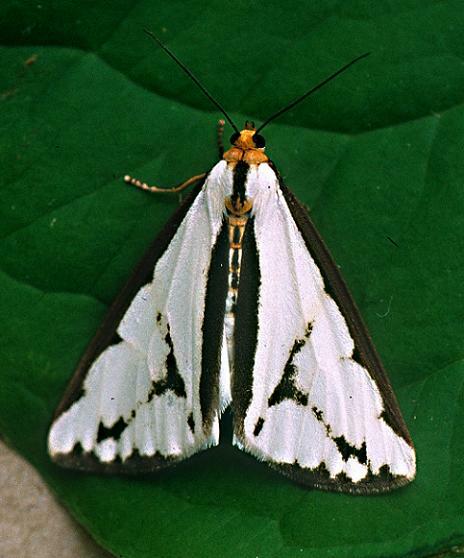 It's called a confused Haploa Moth ( Haploa confusa ). I've seen other Haploa moths but I've only seen one of these. And they're so pretty. EDIT: I got the picture up due to the fact that one of the people from the DSL company fixed the problem with the internet cutting of when my mom is on the phone. The 2 comments above were spam.